Warner Bros. had a big weekend at the box office as Suicide Squad broke records with $135.1 million, shattering the August debut set by Marvel's Guardians of the Galaxy ($94.3 million) two years ago. 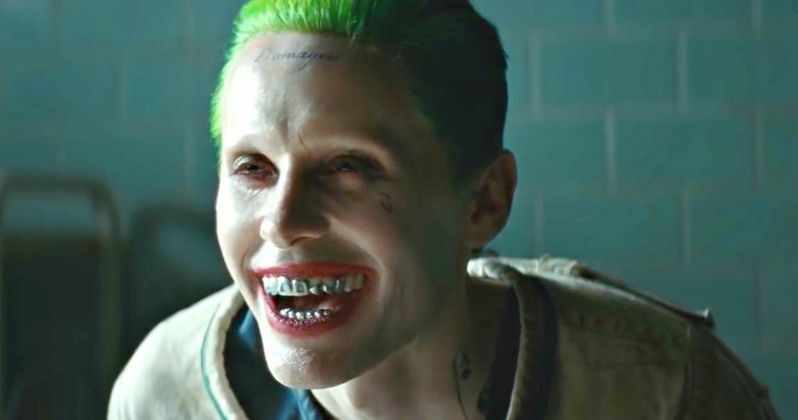 Regardless of its commercial success, the movie was not a hit with critics, and apparently not with an unnamed fan in the U.K., who is filing a lawsuit against Warner Bros. for "false advertisement," regarding The Joker (Jared Leto). This fan and his brother, who apparently is a lawyer, are suing because several scenes that were featured in the trailers and TV spots were nowhere to be found in the finished film. A Reddit user known as "BlackPanther2016," posted a thread this morning, where he revealed his plans to file a lawsuit against, presumably, Warner Bros. and DC Comics. This U.K.-based moviegoer claims their case has been accepted and it begins on August 11. Here's part of his lengthy Reddit post below, where he details the scenes shown in the trailers and other bits of footage that weren't included in the theatrical cut. "Suicide Squad trailers showcased several SPECIFIC Joker scenes that I had to pay for the whole movie just so that I can go watch those SPECIFIC SCENES that WB/DC had advertised in their trailers and TV spots. These scenes are: When Joker banged his head on his car window, when Joker says, 'let me show you my toys', when Joker punches the roof of his car, when Joker drops a bomb with his face all messed up and says, 'BYE BYE!' Non of these scenes were in the movie. I drove 300 miles to London to go watch these specific scenes they had explicitly advertised in their TV ads...and they didn't show them to me. Adding to this, they were also 2 specific Katana scenes they advertised that were also the reason I wanted to go watch the movie. These scenes were: Katana's eyes going black, and a slow motion shot of her and her sword taking souls...in a smokey kind of style. These scenes were advertised several times in the 1st trailer and many TV ads...but they didn't show it to me in the movie. I wasted a lot of money paying and travelling to go watch this movie because of these specific scenes they had advertised to me and all of us saying, 'hey, check out our preview! this will all be in our movie, come watch it on the 5th!!' All lies. I told the theatre about this unjust act and said I didn't get what I came here to see...can I have my money back. They laughed at me and kicked me out. So I'm now taking this to court. I want my refund, the trauma of being embarrassed as I was being kicked out and people laughing at me for wanting my refund, and also the 160 pounds of fuel money I used to drive to London from Scotland." It seems this unnamed Redditor may also be suing the specific movie theater that he went to in London, for kicking him out, but we don't know for sure. We also don't know where this case has been "accepted" and/or how long it will actually last in the court system for. Regardless, 'BlackPanther2016,' had this to say about movie studios' tendencies to show footage in trailers and not have those scenes in the theatrical cut. "If you advertise something...give me what you have advertised. Period. This is becoming a habit with movie studios, showing epic scenes in trailers...but their never shown in the movies. It's unjust. I just want to say, join me if you feel the same way. Let's stop this nonsense of false bullshitery...and don't let them bribe you with their 'deluxe premium special directors gold extended edition supreme cut' nonsense. You should get what they advertised as their first theater showing and what you have paid for based on what they have showed you in their advertisements. Our court process will begin on 08/11/16 this week." Of course, it's not terribly surprising that the scenes 'BlackPanther2016' mentioned in this Reddit post weren't in the finished cut, since this has become a fairly common practice. While director David Ayer has hinted there will be plenty of deleted scenes, he also said that the theatrical version was his "director's cut," so we'll have to wait and see if these scenes are included in the Blu-ray and DVD edition. As you can imagine, the original Reddit thread is filled with colorful comments, which you can check out in the link above, and stay tuned for any updates on this lawsuit.